Landmark School has academic year and summer programs for students who struggle with reading, writing, organization, time management and ADHD. 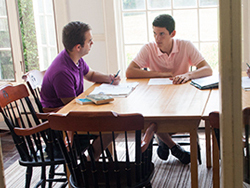 To schedule an appointment during the 2017 SAES Boarding School Fair, November 11-13, please contact Elizabeth Parker, Director of Admission, at [email protected]. Landmark School offers a challenging and dynamic high school experience for students in grades 8 - 12 who struggle with dyslexia, writing, and organization. We provide an individualized college preparatory program, the cornerstone of which is our renowned, one-to-one daily tutorial. Small class sizes, specially trained faculty, and a proven track record prepare our students for a lifetime of success. Landmark students have average to superior intelligence, are comfortable socially, are eager to pursue a variety of interests inside and outside of the classroom, and are often bright, creative, "big picture thinkers". "For 45 years, Landmark School has been empowering children with dyslexia and other language-based learning disabilities to gain self-awareness, reach their potential, and develop self-advocacy skills to be successful in a competitive world. This unique school is a true leader in the field of educating young people with dyslexia." Landmark's curriculum addresses a range of needs for students with dyslexia, other language-based learning disabilities, and weak executive function skills. Through daily tutorials and small classes we teach students to become independent learners. 100% of our graduates are accepted to college and 94% attend. Landmark designs an individualized program for each student and continually assesses his/her needs to determine the appropriate approach for success. Life on the Landmark School campus is a vital mix of arts, athletics, community service, planned outings, cultural and civic influences of world class city like Boston, and even some adventure. Students can participate in everything from drawing, painting, and sculpture to outdoor leadership, yoga, woodworking - and so much more. Landmark's residential life program emphasizes responsibility, respect, and independence. From reaching and exceeding academic goals, leading the way on a community service project, planning a trip with fellow housemates, or just balancing school and personal life, students learn positive self advocacy skills and grow into capable, confident young adults. Our program provides a highly supervised living and teaching environment. Simply put, Landmark students gain critical skills that they then bring to college and beyond.